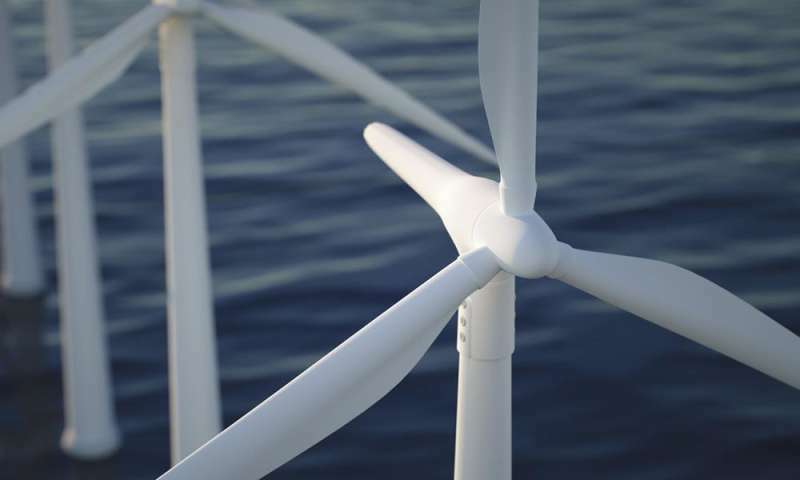 Scientists from Universidad Carlos III de Madrid (UC3M) have designed a new control system for wind turbines in offshore wind farms that allows power transmission to the coast in a more flexible and cheaper way than current solutions. This innovation allows the use of a diode rectifier station in the offshore platform of a high voltage direct current (HVDC) link. In this way, the wind turbine's alternating current (AC) can be easily converted into direct current (DC) for HVDC transmission. The researchers have developed a distributed control system to synchronise and regulate the electrical voltage and frequency of the wind turbines of the offshore wind farm. This allows the transmission of energy to the general network through an HVDC link with a diode rectifier station. "It is less complicated, cheaper and more flexible than other current solutions," explains co-author Santiago Arnaltes Gómez, head of the UC3M Power Control Group. This new system synchronises the wind turbines without using any additional element, since it uses the wind turbines' capacity to contribute to voltage and frequency control. One of key factors is the use of diode rectifier stations, which reduce the cost of the offshore rectifier platform by up to 30 percent, according to some studies. "What we have managed to do is to provide the technical feasibility necessary in order to use this kind of rectifier, since at the moment, wind turbines still cannot work with them," explains co-author José Luis Rodríguez Amenedo, from UC3M's Department of Electrical Engineering. The researchers have developed three patents in relation to this system, which they have validated by means of simulations, small-scale laboratory prototypes and proofs of concept. The next step is its commercialisation and industrialisation. "Our main clients would be large electricity companies that have the capacity to make these diode rectifier stations," said Amenedo.